The primary mission of Favrot Student Union is to provide services, and programs that are positive to students’ developmental needs as well as provide recreational needs of the campus and community. Through the work of its staff and various committees, Favrot Student Union is a “laboratory” where students can learn and practice leadership, programming, social responsibility, and interpersonal skills. Additionally, Student Activities programming complements the academic program of study and enhances the overall educational experience of students through the development of, exposure to, and participation in social, cultural, and recreational programs. The Favrot Student Union is more than just a building; it is an organized staff of concerned people working to provide the best possible activities. Programs and services for the University Family, visitors and friends. To support the staff in its efforts is the Favrot Student Union Advisory Board, a student organization comprised of five functioning committees (Activity, Hospitality, Publicity, Research and Evaluation and Artistic and Cultural). Through these committees, three-fourths of the campus’ entertainment is planned and coordinated. Miss Grambling State University and the Royal Court and Miss Cover Girl are all a part of the Favrot Student Union Board. However, the Favrot Student Union and the Favrot Student Union Board is always open to suggestions, comments and input from the University family, especially our students. Students with an interest or desire to grow socially, culturally, spiritually and philosophically in the views of the University, should join one of these committees. The Favrot Student Union is part of the educational program of the University. As the University community life, it serves as a laboratory of citizenship, training students for social responsibilities and for leadership in our democracy. It encourages self-realization and growth in individual social competency and group effectiveness. Its goal is the development of persons as well as intellects. The Union serves as a unifying force in the life of the University, cultivating an enduring regard for and loyalty to the University. 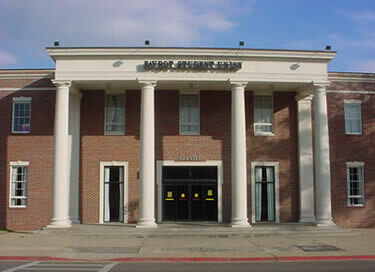 The Favrot Student Union, located in the center of the University campus, provides a place where students, faculty, staff, alumni and campus guests meet for recreation, socialization, relaxation and extracurricular activities/programs that are educational and enjoyable. The first floor of the Favrot Student Union has a large student lounge that is adjacent to the Games Room and Bowling Center (Tiger Lanes). The Game Room has ten (10) coin operated billiards tables and several pinball machines. Tiger Lanes has eight bowling lanes with the scoring, etc. controlled by computer. The eighty-four inch screen television draws a large audience for all of the latest movies and programs that are on satellite. The second floor, which is made accessible by stairs next to Tiger Express or an elevator on the second deck, accommodates all of the offices, staff and students (Student Government Association and Favrot Student Union Board). There are five (5) meeting rooms which include the multipurpose room, that are used daily for meetings, conferences, receptions, etc. The Black and Gold (Ball) Room has numerous functions from a conference for 200 to a reception for 800. Reservations for meeting rooms should be made with the reservationist in Room 214 of Favrot Student Union 2 weeks prior to the event. Student organizations requesting use must register in the Campus Organizations’ Office. Room Request Forms must have the advisor’s signature and an Advisor must be present for all events.